Why Does Earth Have so Little Water? Did you know that Earth—with its oceans, rivers and snow covered caps—actually has a water deficiency, according to the standard model of the Sun’s proto-planetary disk? Astronomers studying how the Earth formed out of the dust and debris of the early Solar System have been stuck trying to explain why the Earth lacks so much of this (seemingly) abundant substance. It should have formed in a region plentiful in icy material. In other words, Earth should be a water world, similar to Neptune or Uranus. These theories are based around the snow line (also known as the frost line), which is the distance from a protostar (like our Sun) in which hydrogen-based matter (water/methane/ammonia) can freeze, separating rocky planets from gas/ice giants. Our Solar System’s snow line currently lies within the asteroid belt between Mars and Jupiter. The conventional model says that the disk was fully ionized and so material would have been funnelled onto the star. This line was said to have started out at least one billion miles from the sun, but as it cooled down it retreated inwards past Earth’s orbit BEFORE the planet had time to form. But if this line had moved before Earth was formed it should have been constructed into an icy planet, rich in water. The latest study by Martin and Livio, says that the disk couldn’t have been fully ionized because normal stars don’t have the ‘energetic punch’ to do it. This means that the normal mechanisms going on can’t function as previously thought, so matter can’t move in towards the star and instead it sits in orbit. This leaves a ‘dead zone’ about 0.1 AU out, which acts like a wall that prevents material moving beyond it, however this build up in turn heats the region (stretching for a few AU) due to gravitational compression. 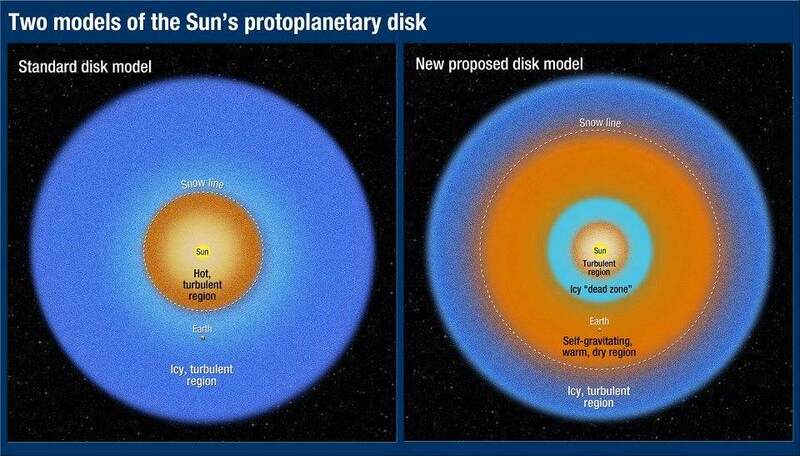 Ice would have been evaporated leaving Earth to form out the dry material left over, and so this new version of the proto-planetary disk (featured below against the old one) now accurately explains why its composition lacks so much water.